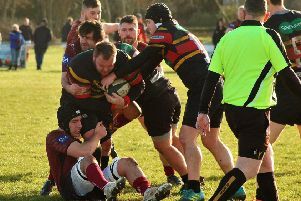 Lutterworth were clinical in their finishing, especially when pouncing on unforced errors as Melton fell to their 15th defeat of a forlorn Midlands One East season. 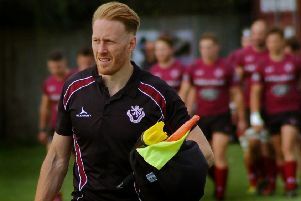 To a man the Melton team battled throughout the match and the 71-3 scoreline rather flattered the hosts at the final whistle despite Lutterworth’s excellent pressure rugby around the loose ball. Jordan Pawley, Tom Allen and Luke Pawley continue to improve their scrummaging, while Dave Meakin and James Long added strength and power from the second row. The back row of George Kaczmarczyk, Dan Evans and the outstanding Jack Forfar were everywhere, tackling, carrying and supporting. Their work rate was phenomenal and they deserved more from the game. Young half-backs Archie Hutchinson and George Morgan-Jones continued to be a pairing for the future and made good use of the ball when generally going backwards. Captain and leader Leon Gormley, as ever, was superb, playing in the centre and Ollie Circuit counter-attacked at every opportunity. Morgan Jones kicked the three points when offered the chance, but it was a small reward for the first-half effort the team put in, turning around 29-3 down playing into the ever-increasing wind. Despite fantastic backs-to-the-wall effort, three stay kicks and the bounce of the ball, which always goes the wrong way when you’re losing, allowed the hosts to score another 42 unanswered points. While the margin of defeat may be deflating, the attitude and aptitude continually shown by a very young side to training and playing, out doing their best and improving all the time, still offers some encouragement. The firsts have a weekend off from their league travails, but most are expected to play for the Second XI in cup action against Hinckley, underlining excellent commitment.